Members of the Polymer Division pose around a Fiat chassis displayed in the Lingotto conference facility. At the wheel is Division President Jung-Il Jin. The Polymer Division had a very effective and lively meeting over two days during the 2007 GA. About 33 participants from more than 12 countries attended. The individual subcommittees and areas reported their activities since the last meeting that was held at the IUPAC MACRO 2006 conference in Rio de Janeiro, Brazil. It is important to note that beginning in 2008, Christopher Ober, (Cornell University, USA), who is currently vice president, will become president of the division since Jung-Il Jin was elected IUPAC president and will have to vacate his division leadership. The Subcommittee on Polymer Terminology is presently working on 19 individual projects, a number of them in cooperation with Division VIII. One of the major tasks is to complete the second edition of the Compendium of Macromolecular Nomenclature or so-called Purple Book. A number of projects are close to publication or final review, and some new projects are envisaged. There was one publication in the biennium and the Japanese translation of the Purple Book. The Subcommittee on Structure and Properties of Commercial Polymers addresses important problems in the field of basic research and establishes international guidelines and instrumental methods. Its success is represented by the number of publications—five between 2005 and 2007—and the quotations thereof. The Subcommittee on Molecular Characterization—established in 2006—is currently working on 10 projects (one of them in cooperation with the Subcommittee of Polymer Terminology) with two publications within the last biennium. In the legendary chase scene in the 1969 movie The Italian Job, a gang races in Mini Coopers throughout Torino, including around the rooftop test track of the famous Fiat Lingotto factory building where the GA meeting took place. The Subcommittee on Polymerization Kinetics and Processes consists of 32 members from industry and academia. It has two publications within the last two years. New project ideas include critically evaluated rate coefficients for ionic polymerizations, survey of reliable initiator decomposition and initiator efficiency data, critically evaluated chain-transfer rate coefficients and chain-transfer constants, and termination rate coefficients for radical polymerization in aqueous solution. The success of this subcommittee is easily evaluated by the frequency of quotation of its publications. The Subcommittee on Developing Polymer Materials, established in 2005 at the Beijing meeting, currently has six projects, four of them in cooperation with the Subcommittee on Polymer Terminology. It consists of 38 members (2 from industry) from 14 countries. This subcommittee, which seeks to identify the forefront of polymer science, has projects in the areas of biorelevant polymers and their application, electro-active and field-responsive polymers, self-assembly and aggregation of polymers, and spectroscopy of conducting polymers. Several feasibility studies are presently being prepared. The project area of Education in Polymer Science, also established in Beijing, has voted to become a subcommittee. Presently, six working areas are covered and there are three projects directly related to practical teaching courses that have had extraordinary success. Division IV serves as the interface between polymer science and the polymer community, polymer science and society, and polymer science and other disciplines with respect to sustainability, energy problems of global warming, and more. The Polymer Division cultivates international relations through human exchange, intersociety exchange within polymer science/chemistry, and in related chemistry fields. Another point of activities is the field of sponsoring international conferences and workshops. Division IV has active and productive relations with the Pacific, European and Asian Polymer Federations, the Research Council of Japan, the Japanese Society for the Promotion of Sciences, the Japanese Union of Chemical Science and Technology, and the Chemical Society of Japan. During recent years a directory of societies in polymer science has been established, expanded, and updated. New entries include exchange programs and post-doctoral fellowships. There were 21 IUPAC-sponsored conferences during the last biennium that produced eight publications (Macromolecular Symposia, Wiley). Starting in 2008, two awards will be offered at the biennial IUPAC-MACRO Conferences. One is an award for a senior polymer researcher, made possible through a grant from the Dutch DSM Company (see Wire section, p. 16 in print), and the other is the Polymer International IUPAC Award, which will be given to a younger researcher. The next meeting will be held in July 2008 in connection with IUPAC-MACRO 2008 in Taipei. Division V President Ryszard Lobinski presenting the division report at the Council meeting. Photo by AK. The location of the Torino GA, in the converted Fiat factory, was an interesting contrast to the usual dull lecture room of a summer weekend in an empty university campus, or to an exhibition hall. We met in the fishbowl-like glass walled rooms of the Torino Polytechnic. Two floors down was an active shopping mall, whose food courts provided a good lunch venue for informal interactions. Outside the coffee area was the circular ramp used in the original Italian Job movie. During any dull moments, those members who remembered, could reminisce about the three brightly colored Mini Coopers zooming down the structure. At the meeting, the Analytical Chemistry Division (ACD) continued its tradition of reviewing work in progress, planning new projects, and highlighting topics of particular significance. A novelty was a full-day analytical chemistry session at the IUPAC Congress, which highlighted the work of the division to a wider audience. The posters of major division projects were also presented. In addition to a discussion on current projects, including those of the Interdivisional Working Party of the Harmonisation of Quality Assurance and the Subcommittee of Solubility and Equilibrium Data, the ACD held a special open session to hear a report by Paul DeBièvre on the “Metrological Traceability of Measurement Results in Chemistry” project. DeBièvre explained how it is necessary to directly trace any measured value to its primary standards (e.g., the kilogram, metre, etc.) for an analyst truly to have confidence in the accuracy of his or her results and an understanding of the uncertainty in the measurement. Usually this will occur through a series of intermediate measurements, but each of these must include a measure of the experimental uncertainty. To make this complex subject clearer to the analytical community, a task group plans to develop a user’s guide with practical examples based on real assays, to illustrate how the relationships are identified (see more in Making an imPACt, in print on page 27). To identify ideas for future work, division members took part in a brainstorming session in which they spent 5–10 minutes, thinking about specific topics for projects, what they thought should be the future direction of analytical chemistry, and, importantly, how the expectations and requirements of stakeholders can be satisfied. This discussion lead to a number of ideas for new projects and ways in which we might develop greater outreach. The ACD was conscious that the committee has largely academic roots and examined ways to involve more industrial analysts, either as committee members or by closer links with project teams, possibly even as corresponding members. In this context we were pleased to welcome two young observers from industry. The ACD is continuing its core tasks of developing terminology for the Orange Book (i.e., the IUPAC Compendium of Analytical Nomenclature) and the Solubility Equilibrium Database. Both projects are closely involved with the developing interaction between IUPAC and FIZ Chemie. The division officers for the 2008–2009 biennium will be Ales Fajgelj (president), Ryszard Lobinski (past president), Walter Lund (vice president), and Brynn Hibbert (secretary). The committee also welcomed a number of new titular and associate members and national representatives. Fourteen members of the Chemistry and the Environment Division, and one invited observer, Dr. Christoph von Holst, who is also a task group leader, participated in the 2007 meeting at the GA. Over the course of the meeting, the division (i) reviewed projects and made decisions on existing projects and new proposals, and decided how to allocate the remaining project budget; (ii) finalized the membership for 2008–2009, including Associated Members and National Representatives and appointed divisional representatives to other IUPAC bodies; (iii) reviewed subcommittees activities and provided time for separate meetings; and (iv) met with representatives of the IUPAC Committees on Chemistry and Industry and Chemistry Education. Thirty-two projects are in progress at the moment, including projects led by other IUPAC divisions and to which Division VI is contributing. Progress of the projects is, in general, most satisfactory, with just two projects in need of reviving since progress is limited. The division allocated remaining project funds for the biennium to three existing projects that had requested continuation and/or additional funds. Each subcommittee provided ideas for new projects for the next biennium. The ideas will be reformulated into draft project proposals, to be discussed in a teleconference to be held in the spring of 2008. The composition of the new division committee was decided upon. Most noteworthy is that in addition to the regular slots for titular members, associate members, and national representatives, a proposal was brought forward for a provisional member, who would be an active expert from a scientifically emerging region of Southeast Asia. Within the subcommittees, several new areas of project activities were discussed, including an ambitious new book series on biophysico-chemical processes in environmental systems. The next face-to-face meeting of the committee will be in September 2008 in Bari, Italy, which will be hosted by Nicola Senesi. The committee was informed that the Perspectives and Recommendations volume from CHEMRAWN XV: Chemistry for Water has been published. The volume was distributed at the meeting to all members of the IUPAC Council. It is available through the Maison de la Chimie, Paris, and is posted on the IUPAC website. 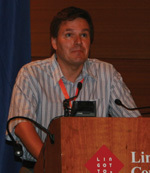 Gary van Loon reported on the successful CHEMRAWN XVII: Greenhouse Gases—Mitigation and Utilization conference, held in Kingston, Ontario, Canada, from 8–12 July 2007. A report on the conference is being prepared for publication in Chemistry International. Pieter Steyn informed the committee about preparations for CHEMRAWN XII: Sustainable Agriculture and Human Well-Being in Africa, scheduled for 3–5 December 2007 in Stellenbosch, South Africa. John M. Malin, chair, reminded the committee that the document History and Effectiveness of CHEMRAWN Conferences, 1978–2006 is posted for reference at <www.iupac.org/standing/chemrawn.html>. Malin outlined a nearly-completed draft document entitled Details for Organizing CHEMRAWN Conferences, which should serve as a guide for future conference organizers. The editor thanks the following amateur photographers for their contributions: Anders Kallner (AK), Lucille Meyers (LM), Michael Hess (MHe), and Morton Hoffman (MHo). Page last modified 20 November 2007.